So, what's a Muttle?! They're kind of like Webkinz. Children get an online code to register their pets, which they can then play games with, interact with and so on. Indulge your love for designer dog breeds with Muttles, the hottest new collectibles this holiday season. Inspired by creative combination dog breeds, like Labradoodle and Puggle, these adorable stuffed pups are made from quality materials to ensure realism and durability. 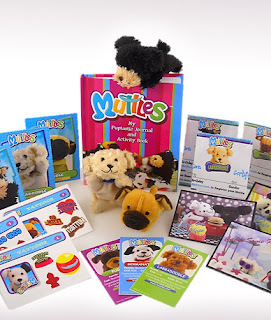 Each 3” plush pooch comes with a bundle of fun and an adoption certificate and registration code so you can register your dog on the Muttles website, where you or your child engage in safe “social petworking” with other owners, enter information about your pup, view and upload photos, and play games.